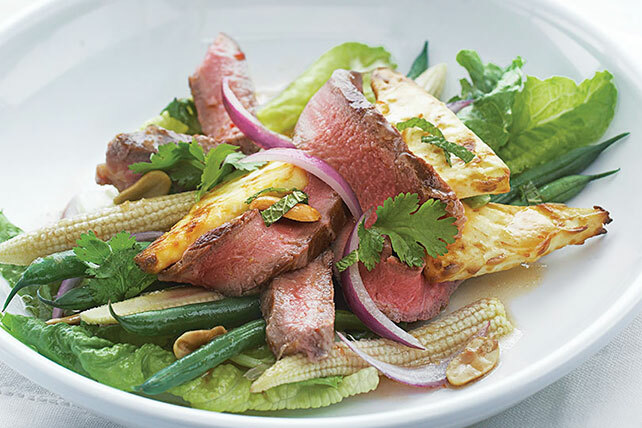 A bed of salad greens is topped with slices of broiled steak, corn, beans, baked cream cheese and a drizzle of Thai-inspired sweet chili sauce. Cut cream cheese into 8 slices; cut each slice diagonally in half. Place in single layer on parchment-covered baking sheet. Spray with cooking spray. Bake 10 min. or until golden brown. Set aside. Turn oven setting to Broil. Broil steak 6 to 8 min. on each side or until medium doneness (160ºF). Let stand 5 min. Cut across the grain into thin slices. Cover 6 plates with greens; top with beans, corn, onions, cream cheese and meat. Mix chili sauce and next 5 ingredients; drizzle over salads. Top with nuts. Save 30 calories and 4 g of fat per serving by preparing with PHILADELPHIA Neufchatel Cheese. Substitute 4 boneless skinless chicken breasts for the sirloin steak. Broil or grill 4 to 6 min. on each side or until medium doneness (160°F). Slice, then add to salad as directed.